How many times have you wished you could quickly and easily rearrange the layout of your boat to suit the day's agenda? Atomix Boats has come up with a simple solution for improving small boat versatility: the sliding console. This offers a slide-to-suit arrangement to cater for varying loads and activities. Changing the layout is easy: loosen four locking screws, slide the console to the side and tighten the locking screws. Atomix Boats general manager Richard Cains outlines one of the benefits the innovative new design: "The sliding console makes the 420SC a true multi-person or single-operator boat. It comes into its own when you're fishing with three people on board, as you can slide the console off to one side to provide a decent walk-around area." This model was released at the 2012 Helsinki Boat Show and orders have already been taken for a whopping 600 boats. This is largely due to design input from Atomix's Finland distributor, as well as the craft's easily-handled and cost-effective design. "It's hugely popular with people who live in the archipelagos that can only be accessed by water. It's almost like their small Nissan Micra to run down to the shops for supplies in and it's rated to carry four adults, or 550kg of people and gear," says Cains. 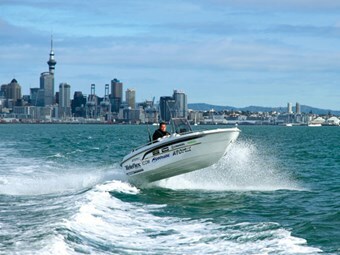 To offer the maximum amount of boat for the minimum cost, production takes place in a purpose-built factory in China under the supervision of a qualified New Zealand boatbuilder. In order to keep shipping costs low and the flow-on cost to the buyer down, the Atomix 420SC has been cleverly designed so that 12 hulls fit into a 40-foot shipping container. The latest computer technology has also been employed to maximise fuel efficiency without sacrificing on-the-water thrills. "It's fully CAD and hydro-dynamically designed for optimum performance," comments Cains. For a small, budget-friendly boat, it's certainly well endowed. The battery, tote tank and battery switch are neatly hidden beneath the helm seat, with space for an extra battery if required. Squabs are optional but a good idea if you enjoy kicking back with a rod over the side. There are six strategically-placed rod holders and a removable bait board that clips on to the grab rail amidships, so it's easily reached from both ends. 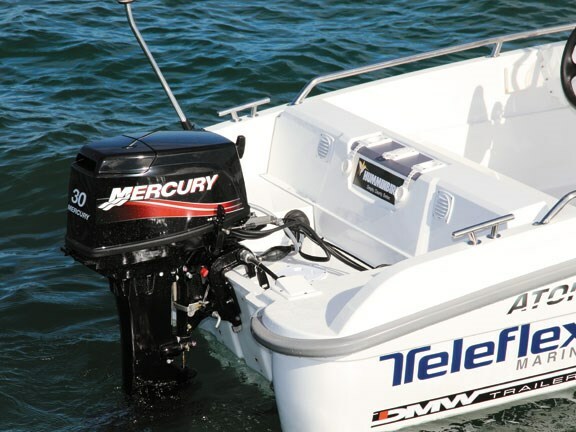 Navigation lights and a removable anchor light are included as standard for twilight fishing excursions. Handholds are within easy reach, with full-length grab rails down each side and an additional grab rail encompassing the wrap-around windscreen. Dash space is limited but it's been used to good effect, with a VHF, switches, throttle, ignition, steering wheel and a 12-volt socket neatly squeezed in. There's plenty of room for a depth sounder on top, but you can't go too big or visibility will be impeded. 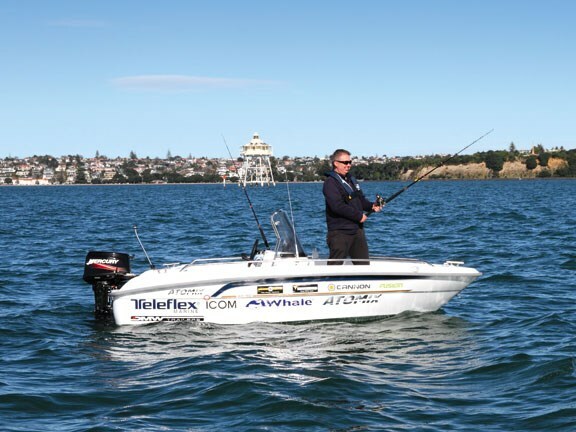 Atomix Boats offers the Hummingbird 550X fish finder as a standard option. The anchor is hidden away in an easily-accessed locker up front and you don't have to reach far to get it over the side. A bow roller isn't fitted but can be optioned in to protect the GRP finish. Non-skid on the bow and a boarding ladder are standard inclusions for safe boarding. Extras include a bimini top and button-on squabs for the front and rear seats. Cains says the options are pretty limitless and they've even got a wash-down system available for it. The 420SC comes with a five-year hull warranty and meets international certification standards. "It's fully CE and ISO-certified as unsinkable and is filled with closed-cell foam. It also features a self-draining cockpit complete with seacocks to shut the system off if required," he adds. The Atomix 420SC is lightweight (240kg) by design and with the maximum amount of horsepower bolted to the back, getting some air beneath the hull to assess the ride was a breeze. With the hammer down, the little boat races to an impressive 32mph when flying solo. It proved to be an exhilarating and comfortable ride, thanks to the close-to-the-water views and a smooth, dry ride which defies its small stature. However, conditions were mild. The screen provides ample wind protection for the skipper, but with the freedom of a centre console comes exposure to the elements. Yet with a boat like this, that's all part of the fun. 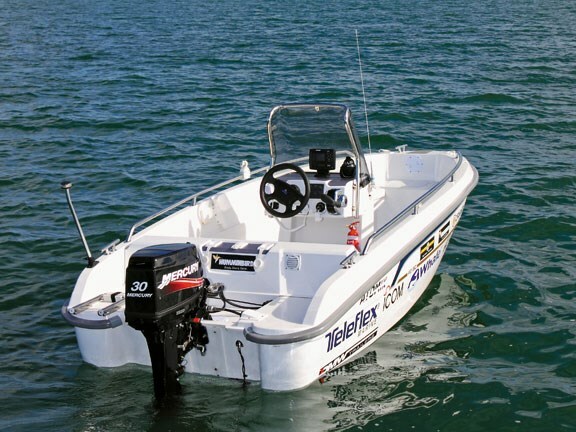 Although fitted with a self-draining cockpit and foam-filled buoyancy, there's not a lot of freeboard so they are required and the boat is designed for sheltered waters. Our test boat had the Fusion stereo system option fitted, allowing your favourite tunes to be cranked while fleeing the daily grind. 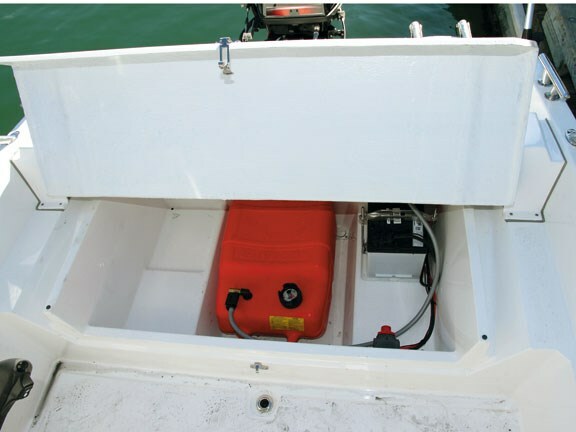 The foam-filled GRP hull is quiet, but with the driving position close to the two-stroke outboard, engine noise is par for the course. The 420SC can be tender at rest, especially when moving around the bow area, so care needs to be taken when shifting loads. The sliding console provides a means to balance this out. If you're flying solo, keep the boat straight and centred to enjoy the serenity, or slide to the side to accommodate passengers or gear up front. Due to an oversight at the ramp, the entire test was conducted with the breather on the tote tank screwed shut. In true credit to this boat's frugal nature and the 30hp Mercury's strong engineering, it almost sucked the tote tank inside out without missing a beat. This easily-handled rig comes with a DMW Premier multi-roller trailer. After a quick and hassle-free clean-up, it can be securely tucked away in a standard garage with room to spare. If you like your boating to be cheap and hassle-free then the Atomix 420SC is an attractive little vessel at a very attractive price. She's a nimble, feature-rich runabout that could be likened to a PWC with extra versatility, or even an upmarket, quiet and virtually unsinkable alternative to the classic kiwi favourite, the small tinny.